Denny Jump (Bellevue, WA, United States) on 22 April 2014 in People & Portrait. Player A: "Where is it?!? Player B: "I Dont' know!" Player C: Find it quick or we're gonna get clunked by the ball!" Player D: (with horrified look on his face): Oh my God, we're going to Die!" Player E (with Clemson shirt): Oh Good Grief!! 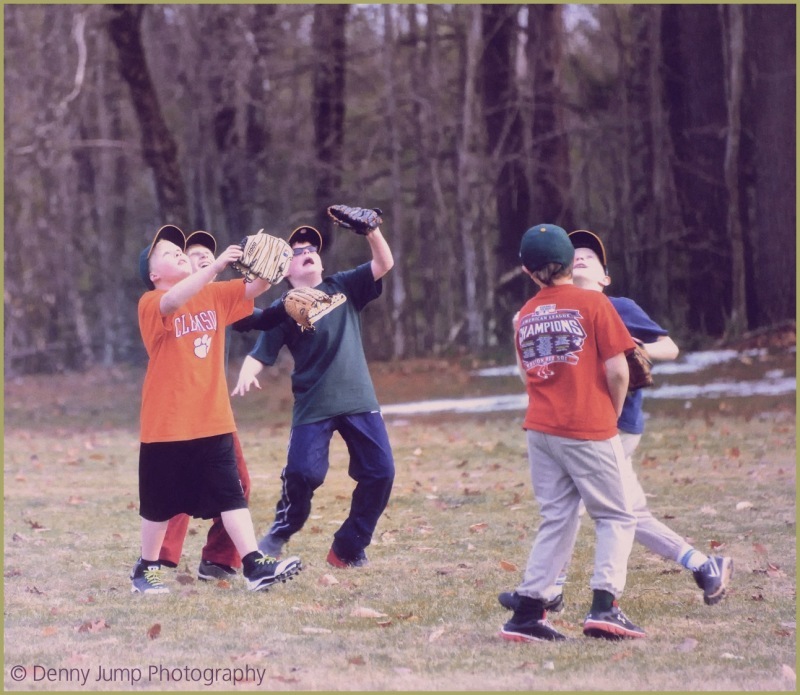 Ah, the joys of youth Baseball :-) Happy Silly Tuesday! Great capture and the text made me laugh. Fantastic capture! I love the drama and emotion! Happy ST Denny! their expressions and the action are priceless! nicely captured! @peggy n: Hi Pegs! Thank you. ;-) ThT is Ryan in the orange shirt he is 10 and a good kid . Tyler is 14 and a Freshman but he plays on the J. V team and he is flipping ' AWESOME at baseball and runsike a flash and also plays football. Just is. 18 and graduates this June he is a fantastic young guy and a very talented photographer he will be going to Japan this summer with his Japanese language class's and will attend college in Toronto beginning this fall .. Love you guys! Fantastic scene and expression captured, Denny! Love it! And I can't believe their is still snow on the ground? Ha, their attitudes rock ! Love the tones too ! hi den: me again: that CAN'T be Ryan --- he's still a baby!! thanks for the age update. still like this shot. so cute. don't know ANYTHING to say about the lighting, etc. love to you guys, too. That's hilarious, and a prize winning ST shot. 5 baseballs for you.